Spike Lee debuted his new movie "Chi-Raq" in New York on Tuesday and took part in an anti-gun march with Chicago's Father Michael Pfleger after the premiere. CHICAGO (WLS) -- Spike Lee debuted his new movie "Chi-Raq" in New York. He said wants Mayor Rahm Emanuel to be held just as accountable as former Chicago Police Supt. Garry McCarthy for violence and police behavior in the city. The director filmed "Chi-Raq" in Chicago's Englewood neighborhood last summer. The film explores ways to stop the bloodshed on city streets. 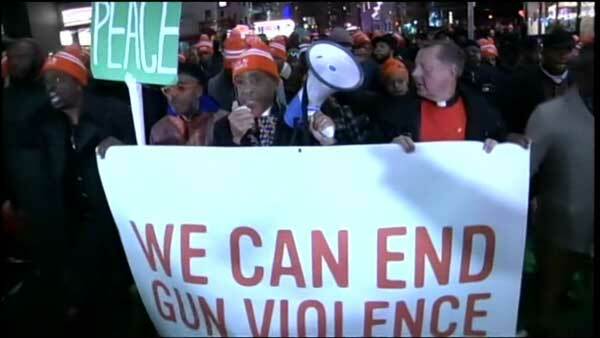 Lee and Chicago's Father Michael Pfleger, who is portrayed in the movie by Evanston native John Cusack, took part in a march after the premiere. The march was an anti-gun protest. Lee led a chant in support of Chicago and the survival of the city's children.